A monthly Welsh language religious periodical serving the interests of the Established Church's missionary work. The periodical's main contents were articles on foreign countries and their native peoples and on the church's missionary work. The periodical was edited by the Reverend Edward Jones. 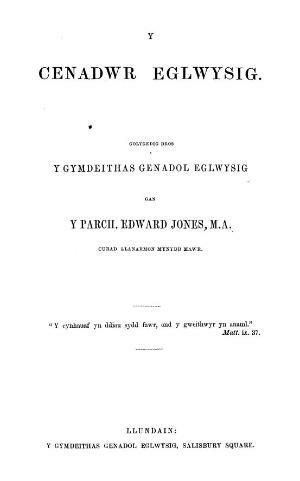 Associated titles: Yr Eglwysydd a'r Cenhadwr Eglwysig (1855). Publisher Details: [Y Gymdeithas Genhadol Eglwysig], 1853-1854.